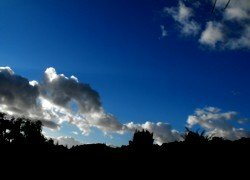 Why is the sky blue? Is a question you might ask yourself every time you look up at the sky, or you could have never considered the question.The sky being blue is something many of us consider a fact of life. Although sometimes during sunrise or sun set the sky can be anything from a deep red to orange-yellow. The fact that earth has an atmosphere is the reason we can look up and see the blue sky. The moon has no atmosphere and looking up from the surface of the moon all you see is a totally black sky with no colour except for stars, planets and such things. So why does an atmosphere make the sky blue. This is due to the tiny particles in the atmosphere such as dust, soot, water droplets and other airborne particles. What these particles do is they refract and reflect the light coming in from the sun spreading the light all over the sky. Light is colour so without an atmosphere on the moon the light comes from one main source the sun and when you look up you can see the sun as a defined spot of light in the sky and everything around it is black. Here on earth some of the sun’s rays are scattered all across the sky so you can look up and not only see a bright sun but also a bright blue sky not just a black background. Now we know why a sky isn’t just black and actually gives off light which was scattered around in the sky by the small particles, but why is the sky blue not green or yellow. Blue light has a very long wavelength and this specific wavelength makes it more likely to be scattered by the small particles in the sky rather than the other visible wave lengths. Basically most of the light passes through the atmosphere, but the blue light which is of a short wavelength and is much more likely to hit a particle and become scattered making the sky blue. On over cast days the sky is usually white because the thick clouds scattered all the visible light wave lengths nearly equally and all the colours put together make white. During a sun set or sun rise the sun’s rays are not coming directly down any more and the light has to travel through more of the atmosphere so it scatters the long wave length of visible light which is red. This simple science experiments with light demonstrates the concept of light rays being scattered by particles. you should notice the contents inside the glass becoming opaque and glowing green or possibly red. The water in this case acts as the translucent air above us and the milk acts as all the particles that disturb and scatter light rays. Go back from 'Why is the Sky Blue?' to home.